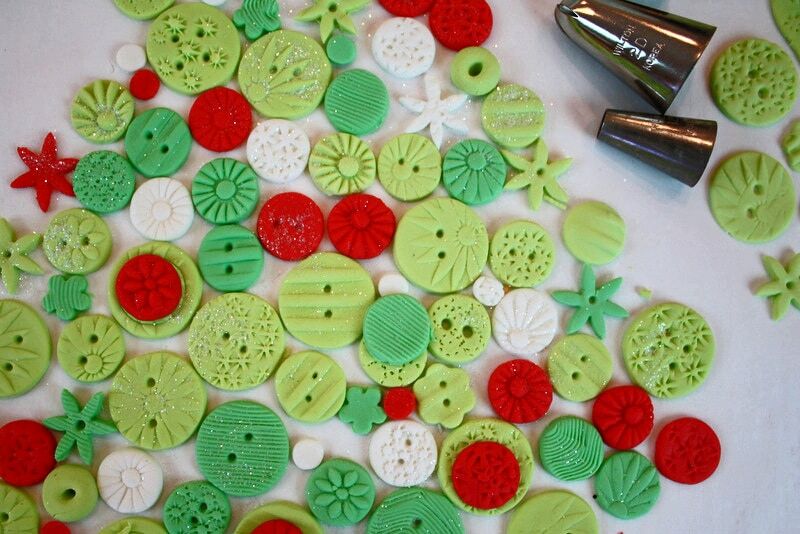 Today I’m going to show you how to make an adorable, unique Christmas Tree of Buttons cake design! I’ve been going through a button phase lately–I’ve seen SO many cute and crafty decorations that incorporate multi-colored buttons in all shapes and sizes. The designs are so happy and cheerful that I knew I wanted to jump on the button bandwagon. I’m not all that crafty, but just about anything can be translated into a cake design. This week, it’s all about the buttons! So basically all that you need is your desired colors of fondant (I knead a little bit of tylose into mine so that they will dry more quickly), you’ll need tools of your choice for embellishing, a toothpick or small piping tip for creating the holes, and small cookie cutters or piping tips for cutting out your button shapes. I used my 2D piping tip to cut out fairly large circles of fondant. 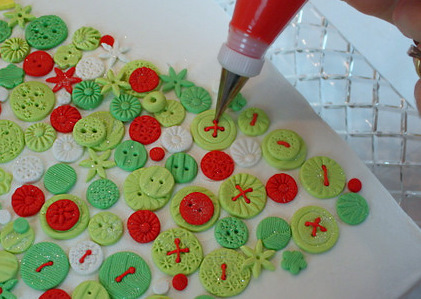 It is also great for making star-like embellishments in the fondant. For smaller round buttons, I used my piping tip 12. 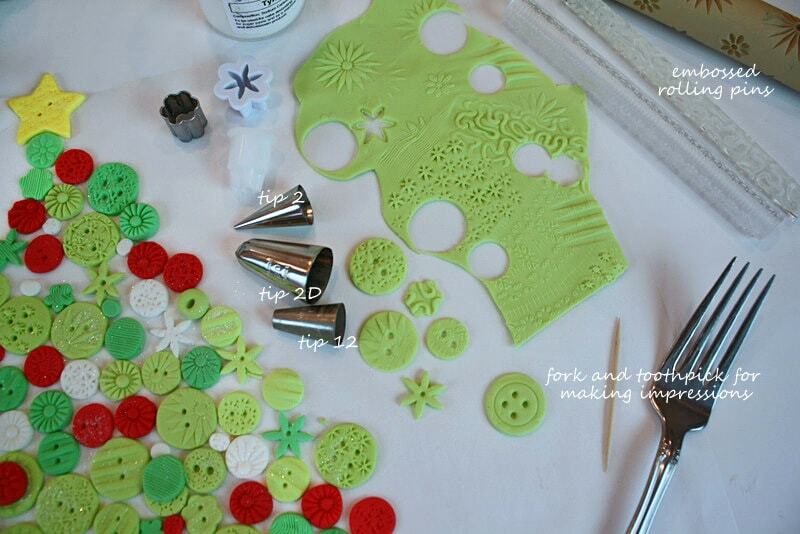 A fork will give a nice ridged pattern in your fondant–be creative with your patterns! I let my buttons dry on parchment paper for a while before placing on the cake so that they could set up a little. I started working from the top of the tree to the bottom, trying to keep a nice balance between the colors. You can overlap them for more depth. Finally, my favorite part—piping on the buttercream “thread”. 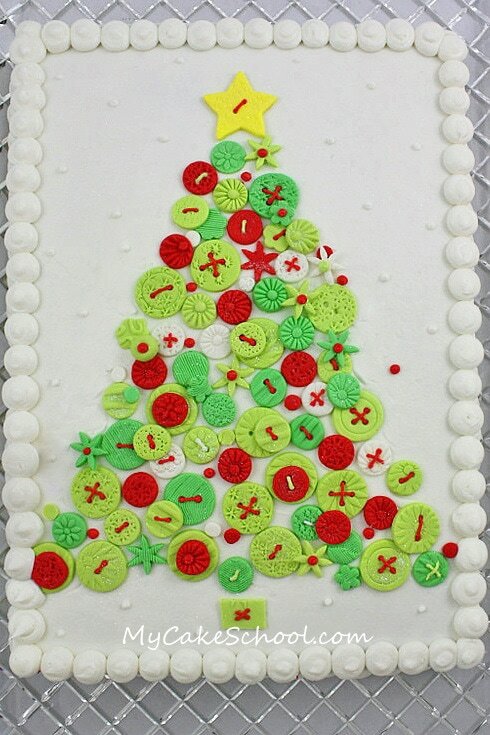 After arranging the buttons into the tree shape that I wanted, I used a piping tip 2 and gradually threaded my buttons with buttercream. This small step really pulls everything together. That’s all there is to it! Here’s our cute little tree! I just love the cheerful, homemade feel of this cake design. So simple and fun. We hope that you enjoy this design as much as we have! Make sure to check out our Recipes Section for the BEST tried and true cake and frosting recipes! For more Christmas ideas, don’t miss our Roundup of favorite ideas! 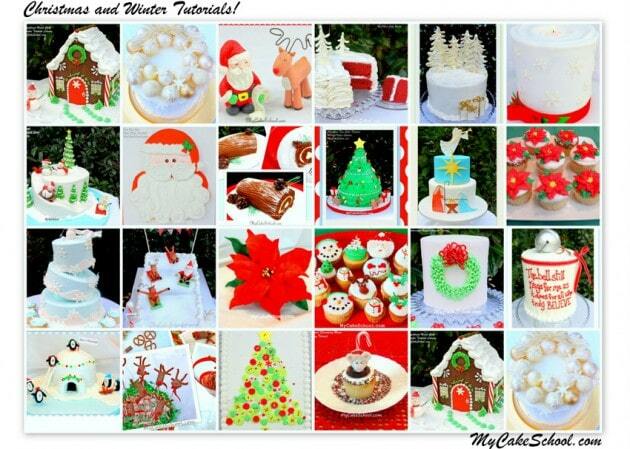 You can find it here: Roundup of Christmas Cakes, Ideas, and Recipes! It is difficult to get deep red when coloring a large amount of buttercream…….we only needed a small amount so it wasn’t a problem. We used AmeriColor Red Red, we also like Super Red. It never looks quite right at first but as it sits it deepens into a nice color. That is such a neat idea. Will definitely put it down as one of my things to do when the opportunity rises. OHH MY word.. that is toooo cute!!! heart it! Is that sugar sprinkled over top that I see? I don’t think you mentioned that part. It’s all in the details. The pictures don’t do it justice. SO cute! Hi Leah–you know, I’m so used to grabbing pixie and disco dust that I think I do it sometimes without even realizing it ;0) . I’m addicted. Yes, that it either white pixie or disco dust sprinkled over the top…whatever was closest. In person, the tree sparkled! It’s hard to capture in photos sometimes. I loved this button Christmas cake!! It reminded me of my Grandmother when all the children collected her old jewelry making a Christmas tree and they framed it so she could put it up each year at Christmas. I am going to use the idea but make mine out of iced sugar cookies. Beautiful design as always. Thanks.